This pumpkin suncatcher is a fun craft to do with your toddler and a perfect way to welcome the new season! Last year my little Monkey and I were lucky enough to attend a Waldorf-inspired playgroup for little ones. It was a beautiful, nurturing space for both of us, and it was there that my little Monkey and I really started doing crafts together. Our playgroup leader, Serena Syn, had a wealth of activities that were suitable for little hands and still ended up looking beautiful. One such craft was this suncatcher, which I have adapted and share here with Ms. Syn’s permission. *Note: I also tried using self-sealing laminating pouch instead, since I had some on hand, but the adhesive in these is so strong that they are much more difficult to work with than contact paper. 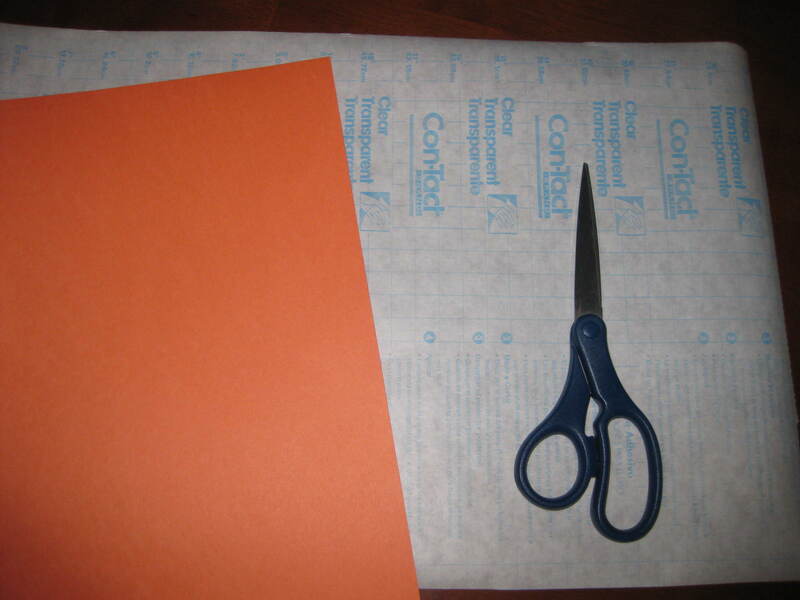 Trace your pattern on the construction paper and cut out the middle. 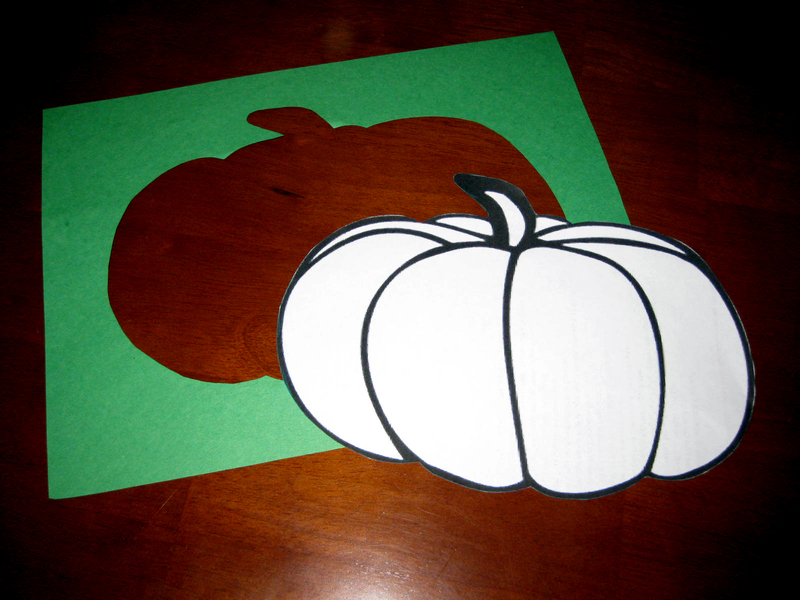 You will be using the outline of the pumpkin as a frame for your suncatcher. Keep in mind that you will need approximately an inch around the edges of the pumpkin to allow for duck tape frame at the end. Cut out a piece of contact paper twice the size of your sheet of construction paper, allowing a bit extra for fudge room. This will give you a piece about 18″ x 12.” Fold the paper in half along the long side, so that it now matches your construction paper. The fold should be along the bottom of where the pumpkin frame will sit. Very carefully take your scissors and make a light cut along the fold of the contact paper, taking care to cut through only the wrapper. 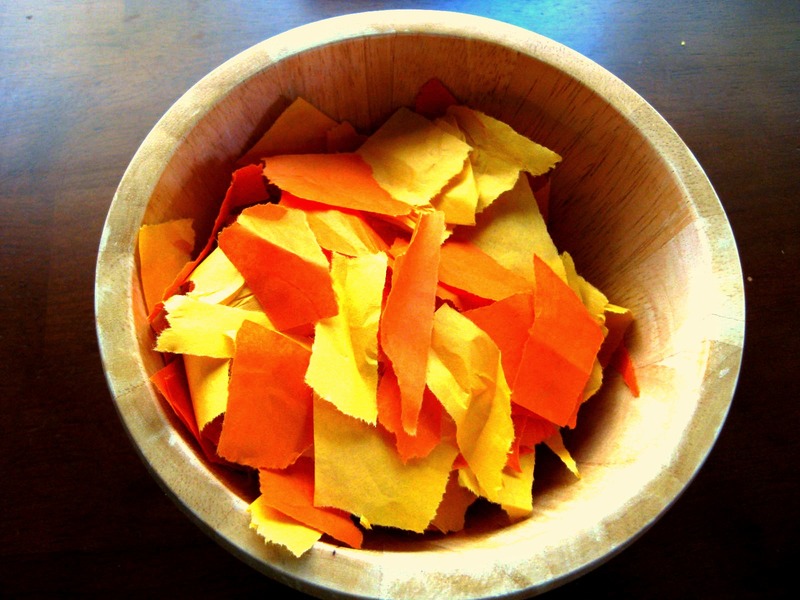 Peel away the wrapper on just one side of the contact paper. You can either place the pumpkin frame inside now or wait until after Step 6, depending on how you would like the back of the suncatcher to look. 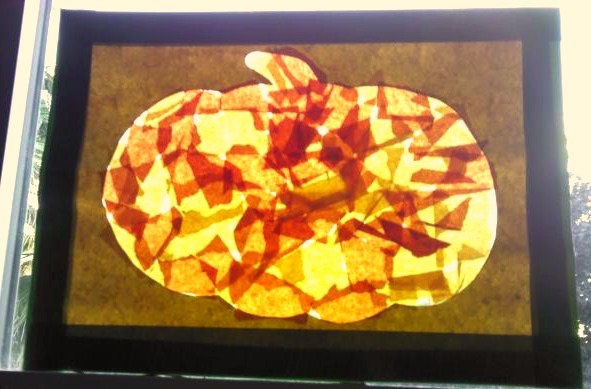 Placing the frame now will make sure the pumpkin is visible on both sides, while waiting will give the back a very different look of just the tissue paper squares. If you choose to do this, you will need about twice the amount of tissue paper. 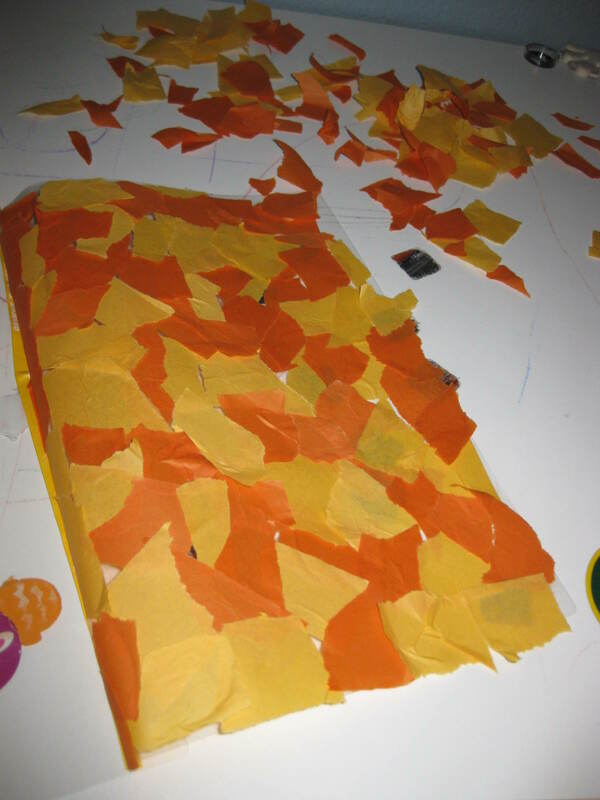 Along with your toddler assistant, arrange the tissue paper squares inside the frame. Again, there is no need to have the squares perfectly laid out in the frame. Allow your little one plenty of space to put the squares in as he would like. Having extra overlaps and even some small blank spots will just add to the character of the suncatcher. 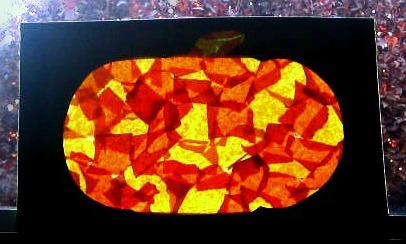 If you did not place the pumpkin frame inside in Step 5, add it now on top of the tissue paper. When you are both satisfied with the result, peel away the wrapper from the other side of the contact paper and carefully fold it on top of your creation. Trim the edges, if necessary. Use your duck tape to make a frame around the suncatcher by peeling off four pieces of the tape and folding each over one edge of the suncatcher. Trim the edges. Place your suncatcher in a window and enjoy! Using a single hole punch to make a hole in the top of the suncatcher (through the duck tape frame). Use ribbon or yarn to hang the suncatcher in a window. Make a turkey or autumn leaf frame instead, using brown or red construction paper and adding red tissue paper to your squares. 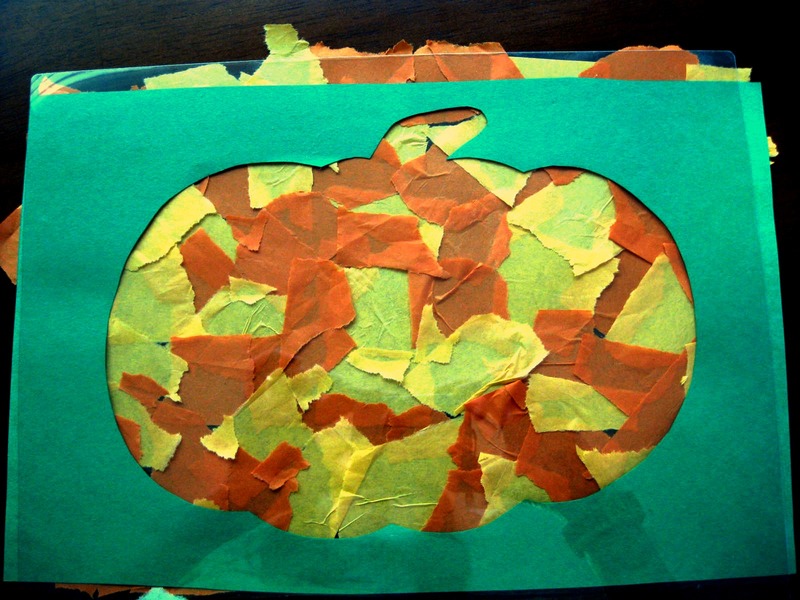 Instead of making a pumpkin frame, make several small pumpkin shapes out of construction paper, and add the tissue paper squares around them. This post has been shared at Milk and Cuddles’ Mommy Club, True Aim’s Mom’s Library, One Creative Mommy’s One Creative Weekend, Living Life Intentionally’s TGIF Linky Party, Bowdabra’s Saturday Showcase, My Life’s a Treasure’s Our Favorite Things, and Sweet Tea Classroom’s Great Pumpkin Classroom Projects. What a great rainy day kids craft. Thank you! Yes, it is nice to have something to occupy little hands on days you can’t play outside.